By using the automated tray-stacker device, the use of longer proof times becomes possible within normal sized sections. Automatic transfer and stacking or unstacking between sections becomes available also to allow for product spraying or cutting of French sticks after proving and prior to baking. The sequence is illustrated in the drawing. A conveyor-belt (1) carries stackable trays to the tray-stacker (2). The trays are automatically stacked by lifting one or more trays, positioning the next tray under it and lowering it a little, in repeat sequences. As an example, say, thirty trays can be built into a stack, which is then automatically transported to the prover tunnel section (3) via a conveyor-belt. The prover door opens at the appropriate time for the stack to go into the tunnel. Which, if required, can house more than one line of stacked trays, for maximum floor space utilization. 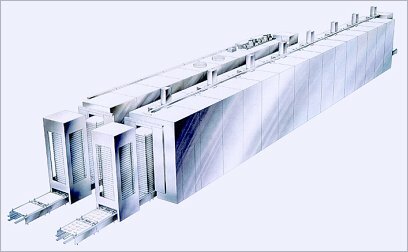 By adjusting the number of trays in the pile or the number of stacks in the prover, it is possible to provide the required output; one thousand or more trays in a prover is not uncommon. Within a prover section there can be compartments or zones, within each of which the temperature and humidity is independently controlled to optimize the product quality and reduce energy consumption. After leaving the prover the pile of trays can be unstacked (4) to a single conveyor level for product decoration (eg. cutting of French sticks, flour dusting or seeding). The individual trays are then moved in line to the oven tunnel (5) where a new stack is formed for automatic loading into the baking chamber. These stacks may be of a different height to those in the prover. In the first compartments of the oven, steam is present, with the number of compartments being dictated by the baking profile, humidity and air-flow requirements, each being controllable to match products and lowest energy consumption possible. Finally the process is completed when products on trays enter the cooler (6) and/or automatic blast-freezer (7) sections. In this system it is possible to design by-passes in the conveyor lines, to produce more flexibly. For instance automatically proving only can be followed immediately by direct blast-freezing of dough pieces or pizzas. Pre or final bake products, with or without proving, decorating or freezing are now possible, using one multi-purpose system. A new era has arrived with this fully flexible, programmable, computer-controlled system. All process parameters can be easily programmed into the computer, not only temperature and humidity but also proving, steaming and baking times. In addition the intensity of the freezing process may be controlled to ensure damage-free products. Processing details are recorded and stored within the computer for subsequent print-outs to assist production and quality process control management. If you wish to receive a brochure about the Tunnel Oven with Tray-stacking please contact us here or download the brochure in a PDF file format in the downloads section, which can be found here.